All our professionals at Brite Smiles of Rhode Island maintain the highest levels of accreditation and pursue ongoing education to stay abreast of the latest trends in dentistry. Dr. Maha G. Alamad is committed to providing her patients with a gentle, caring and comprehensive approach to oral health. She combines an exceptional education, extensive clinical experience, and long-standing personal dedication to improving people's dental health allowing her to bring outstanding functional health and beauty to her patient's smiles. She is well regarded by her patients for her thoroughness and she is a firm believer in conservative and preventative dentistry. She volunteers her time and dental skills to help children in need. Dr. Alamad received her dental degree from Boston University Goldman School of Dental Medicine in which she received numerous achievement awards. She lives with her husband and their two lovely boys in Massachusetts. 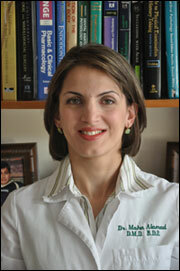 In her “Spare Time”, Dr. Alamad often seen engaged in sports and family activities. Her personal hobbies include reading, art, travelling, jogging and sightseeing. Andrea is the office manager, her cheerful voice greets everyone that calls or visits the office. As a mother, she can’t imagine working anywhere if she wasn’t surrounded by kids. She considers her job at Brite Smiles of Rhode Island more fun than just work and it shows!! Andrea has a love for all children at all ages and strives to deliver exceptional customer service in our office. Andrea's warm and friendly demeanor makes her a great asset to our family. Jeannette is a dental assistant. She loves working with kids!!! Her youthful energy and enthusiasm radiates to all the children and their parents and makes a dental visit a lot of fun!!! She also does a fantastic job in help making every patient’s teeth bright and healthy. She enjoys helping the kids learn more about the importance of good dental hygiene. Jeannette's experience with children and humbled personality gets her lots of complements from the patients and their families every time the treatment is completed. Her high-skills,outgoing personality and caring nature help our patients, even the most fearful, relax and feel comfortable during their treatment. Jeannette is bi-lingual and enjoys helping our English and Spanish speaking families feel welcomed and comfortable. She will be at your side while Dr. Alamad is improving your dental health. Emma is a dental assistant. She enjoys the rewards of working in a pediatric dental office atmosphere and seeing the children achieve a beautiful, healthy, big smile. Emma has a natural talent of making children at Brite Smiles of Rhode Island feel at ease and it is always her goal to make sure that the children have a fantastic time during treatment. On her free time, Emma enjoys spending some quality time with family and freinds.